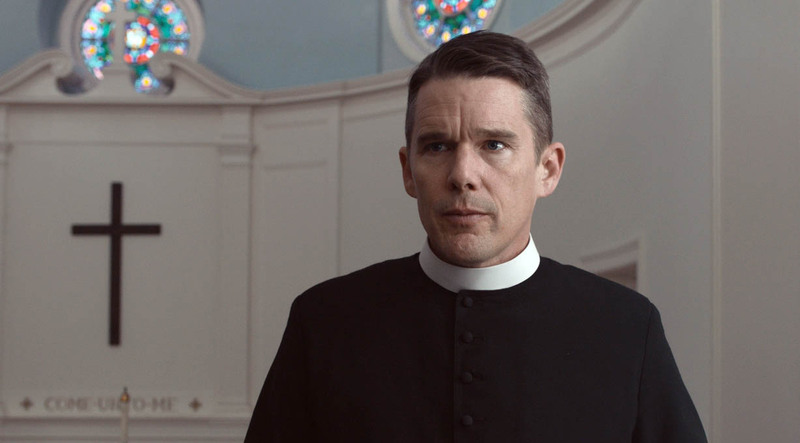 NEW YORK (CNS) — “First Reformed” (A24) has quite a bit to say about religious belief, environmentalism, grieving, alienation, rage, the power of love and the corruption of religion by money and power. That’s a lot of thematic material stuffed into a single film, and although it covers this ground intelligently, not surprisingly, it doesn’t always make its points clearly. It’s also no spoiler to mention that viewers of faith are likely to feel cheated at its conclusion. But there’s much to savor in an often-elegant story about moral dilemmas. Writer-director Paul Schrader (best-known as the writer of 1976’s “Taxi Driver”) does not condescend to belief. He’s interested in examining what faith means and what actions best express it. Rev. Ernst Toller (Ethan Hawke) lives an austerely solitary existence at a tiny Dutch Reformed church in upstate New York, where he delivers Sunday sermons before a tiny congregation, but does little else. It’s not a fully functioning parish, but rather operates as a museum for tourists, managed by the nearby evangelical megachurch, Abundant Life. Toller, a former military chaplain, lost his only child in combat in Iraq, and the strain of that ended his marriage years ago. He’s also in declining health. Mary (Amanda Seyfried) approaches Toller with a painful dilemma. Her husband Michael (Philip Ettinger), a radical environmentalist, is having trouble finding work after a prison term in Canada, and he wants her to abort their child, since he sees no future for the world. So is Toller firmly grounded? For a time. But he can’t solve Michael’s despair over the continued poisoning and deterioration of the planet, and when Michael, who had been planning a violent attack, takes his own life instead, Toller, deeply affected, finds himself drawn to environmental activism. This puts him into immediate conflict with the head minister at Abundant Life, the worldly and smug Pastor Jeffers (Cedric Kyles, also known as Cedric the Entertainer), who very much enjoys the patronage of Edward Balq (Michael Gaston), a coarse industrialist responsible for the pollution in a nearby waterway. Toller also has been in a relationship with Abundant Life’s choir director, Esther (Victoria Hill), but finds her concern for him stifling. A long-planned observance of First Reformed’s 250th anniversary and reconsecration, which is largely a political event funded by Balq, sets up the rest of many conflicts. Toller’s suffering, which he records in a diary, sometimes expresses itself in the language of Christian martyrdom. “How easily they talk about prayer, those who have never really prayed,” he writes. The journal keeping and the troubled tone of his entries recall both Catholic author Georges Bernanos’ 1936 novel “The Diary of a Country Priest” and Robert Bresson’s 1951 screen adaptation of it (which dropped the definite article from the title in English). Like Toller, moreover, the main character in both also faced health challenges. Courage, Toller believes, “is the solution to despair.” But he finds courage difficult to obtain. “First Reformed” is the rare drama in which adults comport themselves as adults while occasionally expressing their bafflement at how easily young people can be lulled into irrational, yet firmly held, beliefs about the world through social media. Schrader doesn’t attempt to provide answers, but he limns this confusion with transcendent artfulness. The film contains some gore, mature themes and fleeting scatological references. The Catholic News Service classification is A-III — adults. The Motion Picture Association of America rating is R — restricted. Under 17 requires accompanying parent or adult guardian.